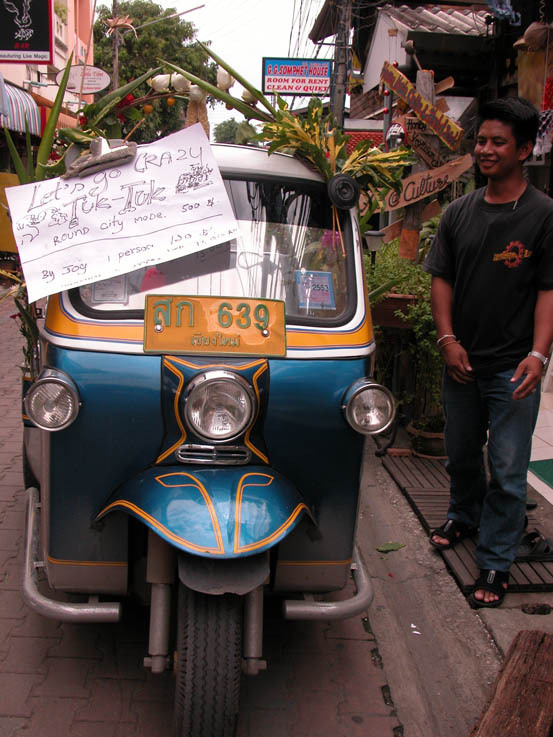 The ‘Let’s Go Crazy’ tuktuk, decked out and ready for action! Continuing from my previous post, on the afternoon of the 14th, Chow kindly donated a large bucket with a huge block of ice in it to the NZ troops and we made very good use of it from our verandah. This made the results of our shooting even more effective than ever. Watching our victims shudder as the ice water hit their back was quite satisfying. We went back to our (now) favourite cafe for dinner – all this battling makes a person very hungry. I had a nice beef curry and rice and the cook gave me some soup to try also. They have a huge pot split down the middle, one side with water and the other side with soup in and it’s always simmering. For soup, they put some vegetables in a basket on a long stick, dip it in the soup for a few seconds then serve the lot in a bowl. It’s very tasty and we’ve add it to our ever growing list of favourite dishes. That night I got to experience a Chiang Mai karaoke bar – dragged along by the local Thais and Westerners. So much for the early night I had planned… A pretty wild scene, yet very safe feeling at the same time. The ratbags from down the Rabbit Hole were up on the bar dancing and the staff took no notice whatsoever. Others were standing on the rotating barstools, also dancing, and miraculousy nobody fell over and nothing got broken. I seemed to be the only one cringeing on their behalf. Guess they’ve had a lot of practise at this. On the 15th (last day of Songkran), Artist Guy across the road acquired a tuk-tuk from somewhere and decorated it almost to death with wreaths of flowers and a Ganesh statue, then hung a sign on it saying ‘Let’s Go Crazy – Happy Songkran Tuk-Tuk. 120 baht per person.’ It did a few rounds, then he kindly organised for only Gill and I and the driver to be on it and we did one last round of the main canal. This is only a few hundred metres down the road but we were away for about 4 hours. Once again, Gill caught many people by surprise with her wicked shooting, but unfortunately, the road by now was so flooded that sometimes we were stuck in the same place for about 10 or 15 minutes at a time. People actually specially lined up along the canal side of the road and got us with a continuous line of buckets. It was a close shave, but we held our own. Later on, Chow (who has now adopted Gill as ‘Mama’ and me as ‘Sister’ cooked us some shrimp fried rice and delivered it to our rooms, where we were flopping about in exhaustion. It was a lovely thing to do and he told us that many of the staff gave him advice while he cooked it, so we feel very lucky and very spoilt. I felt a little bad as I don’t eat shrimp or cucumber, so I had to give Gill my shrimp and hide the cucumber in the rubbish bin in the bathroom while his back was turned, but I ate the rest with relish (it was ‘Aroi aroi’ – delicious) and he was satisfied that he had looked after us. Later on I took the plates back to the kitchen and scared some little podgy scuttling furry thing that was too short to be a rat. Dunno what it was, but I’m still curious. After dinner I showed Chow some postcards of New Zealand and then gave him a short English lesson with some of the kid’s books I brought over with me (courtesy of our local library, bless them). Gill’s lesson of the day, given by artist guy, was that as an elder, she shouldn’t greet people younger than her until they had greeted her otherwise she shortens their life. 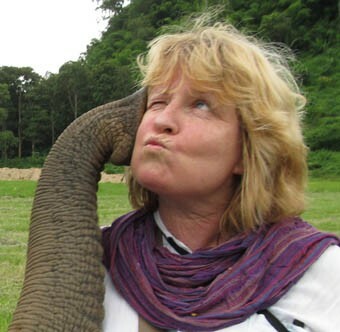 She was horrified – you don’t read that in the guidebooks! So after all this time of her trying to be polite in Thai society, turns out she was doing people a horrible disfavour. Aww heck, you just can’t win sometimes, huh? Our street turned into a street party/disco as the night went on and even those that had been too serious or dignified up until now were fully into it. I popped downstairs to say hi and before I knew it I was being pulled upwards and told to do what was apparantly an obligatory dance on the table. Not so easy when it’s slippery, wobbly and people are still throwing water at you, but I managed it and must have been okay because they let me get down again. Yesterday, Songkran was finished finally. This was a mixed blessing, as it was nice to walk around without being shot at but at the same time it was a stinking hot day and we really could have done with a good drenching! A guy from across the road gave me a guitar pick (Thai) as a souvenir because he liked my guitaring the other night, bless his lovely heart. Gill shouted us a lesson at the local cooking school that’s been walking by every day and from 4 p.m. until 9.15 p.m. we had a combination of intense cooking lessons and equally intense eating. The instructor was a gorgeous bubbly Thai girl with a great sense of humour and the class was well worth going to. I highly recommend doing this to anyone that’s contemplating it. 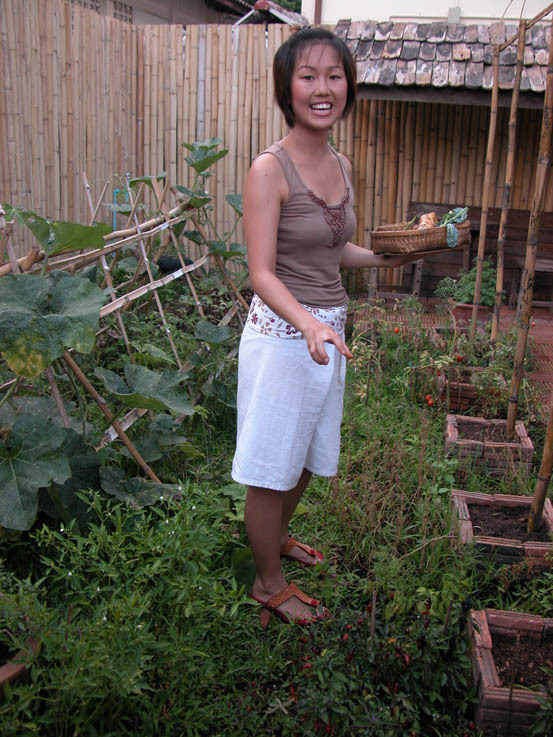 She took us to the market first and explained the differences between noodles, rices, vegetables and tofus and then she took us through her great organic garden behind the school. We learned to make curry pastes, curry dishes, noodle dishes, appetisers and deserts. In our group, we had a Swiss guy, 2 French girls, 3 Americans, 2 Australians and ourselves. This of course turned into a competition between the Aussies and the Kiwis and there were as many cheeky remarks flying as there were ingredients. Naturally, we couldn’t move when we got home, due to overeating, and we weren’t too keen on having breakfast this morning. We lazed around on the verandah having coffee this morning and watched the local wildlife. Fat dog and little dog had their visit. We could hear the Thai mynah bird that lives at the guesthouse greeting all and sundry (it speaks Thai and English) and Gill watched another local dog hop into the wishing-well across the street – lotus plants and all – and have a bath. Goodness only knows what the fish thought. We have discovered that we have a mother cat that has a hidey-hole between the roof below us and the bottom of our storey. She’s slowly getting used to seeing us and is starting to bring her 2 kittens out to play and feed just below us. Tonight I saved some meat from my beef soup dinner so she can have it for breakfast in the morning. She’s a tortoiseshell with beautiful green eyes just like my cat (Otis) at home. We also have a gecko on the wall across from us, a large cockroach in the bathroom and a rat across the road that runs around in broad daylight. We went to the Wararot Market today, where the locals shop. It’s absolutely huge and at one stage we lost each other for a while. But with the help of an Indian cotton merchant, we eventually got back together. This place is full of interesting stuff, from material shops to cooking utensil stalls to stalls with slabs of meat, live crabs, snakey-looking eel things in tubs (never did find out which they were – Chow says he has often shot king cobras as they’re yummy to eat), fried grubs of some sort and very interesting, though not always pleasant, aromas, amongst other things. Again, we got home exhausted and I think Songkran has finally caught up on everyone as the street is noticably quiet. 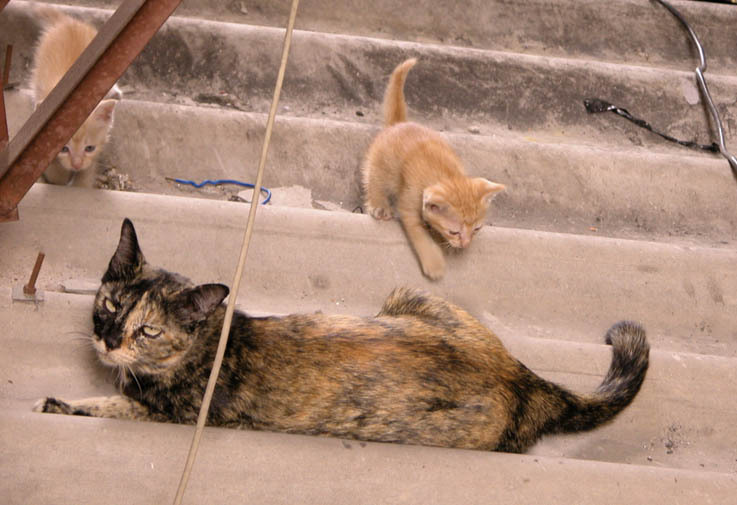 Mama cat and her babies on the rooftop next to our balcony, Chiang Mai. 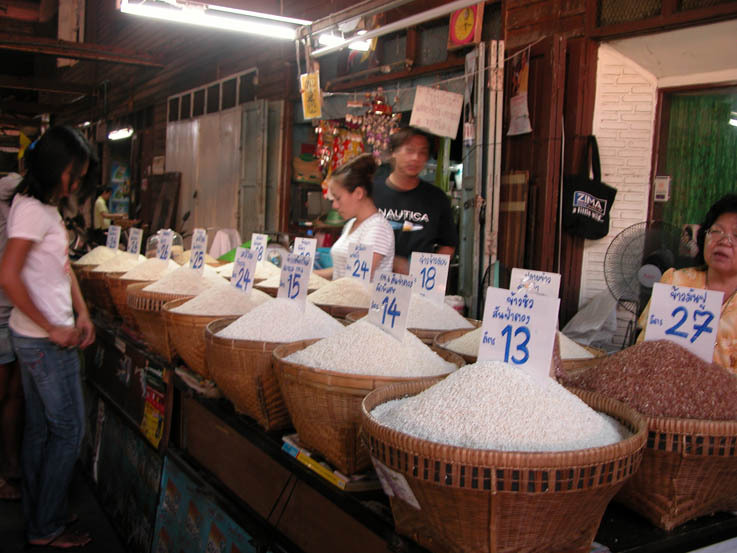 I had no idea there were so many varieties of rice! Our wonderful, bubbly cooking teacher. 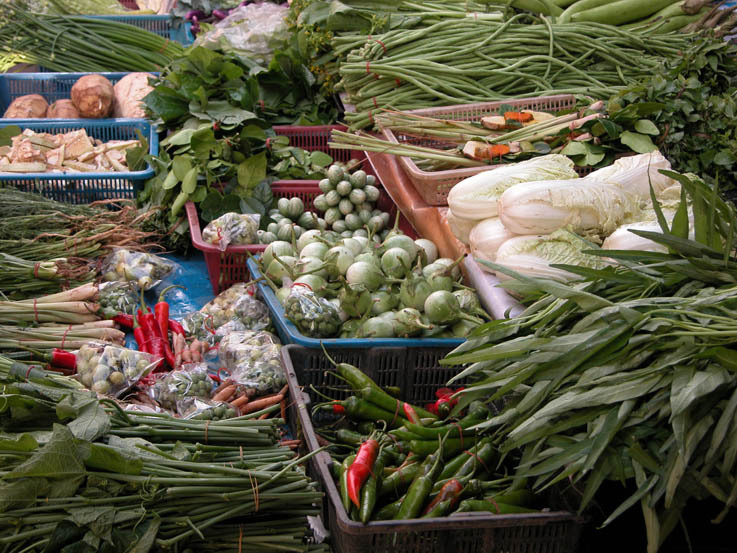 Some of the wonderful varieties of vegetables available in Chiang Mai. 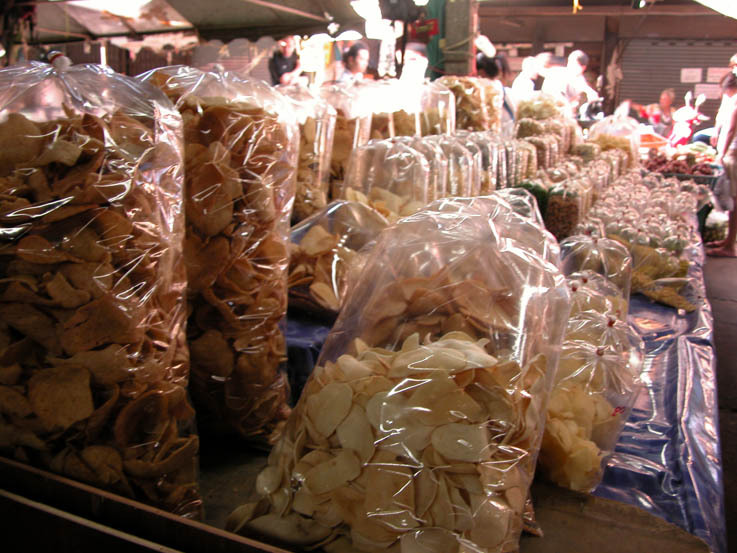 Many foods are put into cellophane bags then puffed up with air. 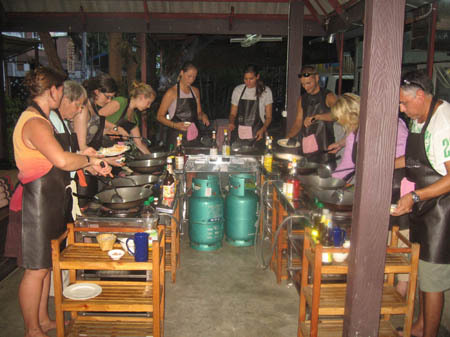 This entry was posted in Ravings - random wafflings, Ravings on Thailand and tagged canal, cat, Chiang Mai, cooking, English, English lesson, gecko, guitar, karaoke, kittens, kiwis, Market, nightclub, Songkran, street party, Thailand. Bookmark the permalink.